High traffic retail strip fronting the Horizon Drive Business Corridor. Excellent retail, professional or service space. Units 121 & 131 are 2017 built. West Grand Junction area industrial office/warehouse and yard property with easy all route access. Office complex with a smaller unit available. Two story stand-alone office/warehouse building on 4 acres zoned Light Industrial. 102,905 SF of Industrial space o 19 acres. West city office/shop/yard w/ three-phase power. 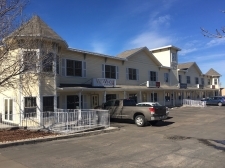 Convenient location in central downtown Hayden. This mixed use property is located on highway 40! Large warehouse/office with graveled yard. 1,500 SF office space in excellent condition.